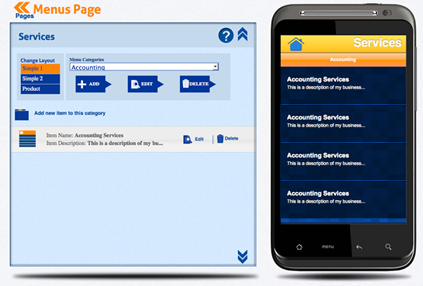 If you’re an Accounting Firm looking for a free app building application to easily create dynamic mobile apps for your clients and potential clients, then look no further! Appsbar.com, the number one DIY App Builder in the world, will help you seamlessly create the right app for your firm, and publish it directly to Google Play. In addition to the brand new native Android app you will receive, you will have an HTML5 app that can be viewed cross-platform on everything from Android, iPhone, iPad, Windows phones, Facebook and Blackberry. To get you started using this groundbreaking service, we’ve given you eight ready-made app page templates (don’t worry, you can easily add as many pages as you like) that can help you to build a smooth, professional, and high-quality app for your company using our Appsbar App Builder! Let people using your app know who you are with a professional and attractive About Page! 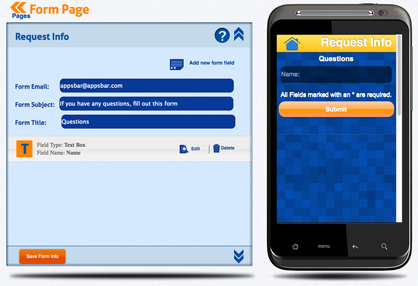 Simply fill in your company’s information using appsbar’s free and easy-to-use content editor. With appsbar, you can use any combination of text and images to bring your dynamic About Page to life! With appsbar’s Services Page template, you have the ability to showcase the services you provide to your clients in one beautifully designed, fully interactive page. The Services Page is a great place to list descriptions alongside images and pricing information for the services you provide. Thanks to appsbar, requesting information from your company has never been easier! 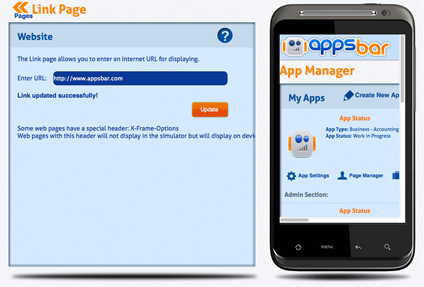 Appsbar’s dynamic and intuitive user-interface allows you to design and implement your own custom forms. You are free to create an unlimited number of forms, allowing your users contact you directly through your app and provide you with important information or questions. Appsbar uses the email you provide when creating the page to streamline the process of interacting with your users, and allows you to be constantly accessible to your clients. The Schedule page within your app is a great way for you to share upcoming events (workshops, discounts, promotions, etc) with your clients. Thanks to the appsbar’s dynamic themes, schedules are professional, easy-to-use, and display beautifully on mobile devices! The Schedule Page is also a great place to display important deadlines for tax preparation and filing throughout the year. 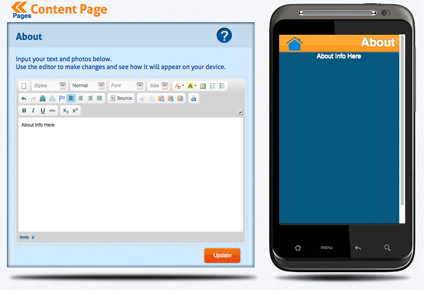 Appsbar also includes a template page that links directly to your company’s website from your free app! 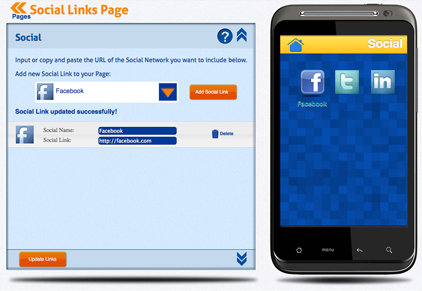 Simply enter the URL for your website into appsbar’s App Builder, and users have instant access to your full website! Does your company have a social networking page? With appsbar’s App Builder, you can give users the ability to connect with you via Facebook, Twitter, LindedIn, Vimeo, Myspace, Youtube, or Orkut. If you don’t see the social site you use listed in appsbar’s App Builder, you can easily add it to your page to provide instant access to users of your free new app! Required on every free app you build using the appsbar App Builder, the Contact Page clearly shows any user of your app how to reach your company. 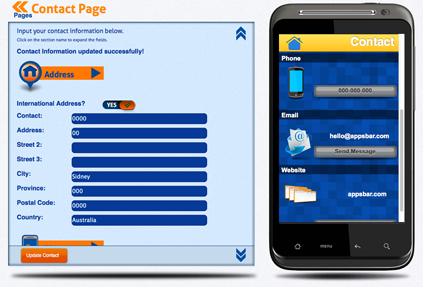 Simply enter your street address, phone number, email, and website information into our easy-to-use App Builder form to allow mobile users to have instant access to the information they need to get in touch with you! 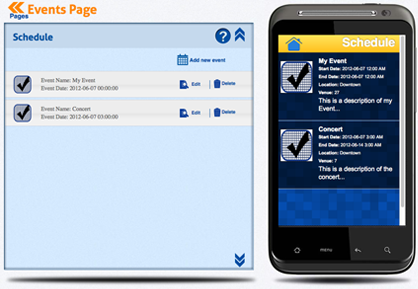 Offer deals and promotions to your clients on their mobile devices! 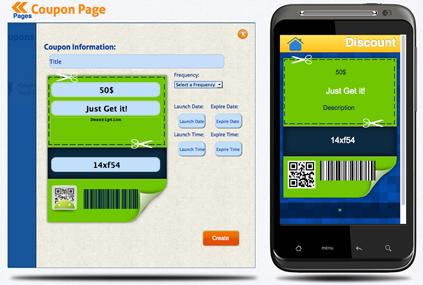 Appsbar’s Coupon Page allows you to create the coupon of your choice with full configurability. Simply specify the details of the coupon, and fill in the launch and expiry dates (coupons can be open-ended) into our intuitive user-interface. With Appsbar’s Coupon Page you’re given full control of your coupon design, free of charge.